Review: Apocalypse for Tea — Soulpepper and Necessary Angel Present "Escaped Alone"
It is in those rare moments where one gets to see something uncommon in theatre that stirs the heart and makes one’s love of theatre grow. 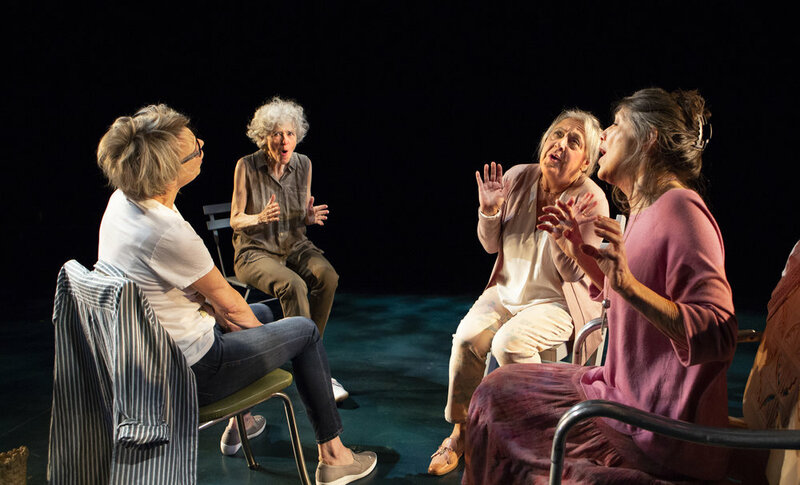 Case in point — Caryl Churchill’s “Escaped Alone”, being presented by Soulpepper in conjunction with Necessary Angel Theatre. The play explores the relationship of three friends in their sixties or older, Vi (Brenda Robins), Lena (Kyra Harper), and Sally (Maria Vacratsis) — and a lesser-known neighbour they don’t know as well, Mrs. Jarrett (Clare Coulter), who arrives and joins them for tea in Sally’s backyard. Mrs. Jarrett listens intently as the three women chat about their lives and neighbourhood, finishing and cutting off each other’s sentences as only long-time friends can do. The action occasionally freezes, and Mrs. Jarrett delivers chilling and surreal accounts of apocalyptic visions, often with details that satirize our current social media climate (for example, people taking selfies amid a disaster event in case they get a chance to post them at some point). Director Jennifer Tarver has chosen a bare set with the required props — chairs and beverages — with raked seating on either side. These are smart choices, as the splitting of the audience to either side creates a more intimate viewing atmosphere, and the lack of set allows the audience to focus on Churchill’s incredible dialogue and the powerful, nuanced performances by each of these highly skilled actors. Brenda Robins’s Vi and Maria Vacratsis’s Sally seem to be the two unspoken leaders of the trio of friends, often being the ones to start conversations, interject in the middle of each other’s sentences, and claim to be right in disagreements both trivial and not-so-trivial. Ms. Robins is a constant spark of energy, whether amiably debating the chronology of businesses at a certain location, or tersely pushing back at one of her friends’ insinuations. And the way that positivity melts away at certain moments to allow the troubling elements of her life to consume her is stunning. Ms. Vacratsis presents a Sally who is warm and kind, yet proud and more than willing to throw light but sharp barbs at even the best of friends in order to have the last word; a polite smile and nod while she tells you flat out that you haven’t the faintest idea what you’re talking about. She enjoys being right, and the way Ms. Vacratsis plays her with a compassionate demeanour while verbally putting her companions in their place is riveting to watch. Lena rounds out the trio, and she is the more reserved of her friends, fighting a deep depression so much that she tells her friends she’s fine with such conviction that it is clear she is trying to convince herself as much as the others. Kyra Harper imbues Lena with a waning spirit; we clearly see Lena’s struggle to keep up with her friends, and to fight the urge to curl up into a ball and give in to her melancholy. Clare Coulter astounds as Mrs. Jarrett, perfectly embodying the persona of the intrigued outsider, listening intently to the other three women’s stories, eagerly encouraging them to tell more of their tales, offering her own complementary tidbits, and seeming to wish she knew these three friends as well as they know each other. Ms. Coulter then shifts effortlessly to her apocalyptic monologues, sharing the details of these bizarre happenings, made all the more chilling with her world-weary voice and haunted eyes. What a rare and powerful treat it is to see a professional theatre production where the cast and production crew are all women, and the characters in the play speak not of the men in their lives, but of their children, their grandchildren, their accomplishments, and their fears. Photo of (L-R) Brenda Robins, Clare Coulter, Maria Vacratsis, and Kyra Harper provided by Cylla von Tiedemann. The show is being staged until November 25th, 2018 at the Young Centre for the Performing Arts, at 50 Tank House Lane in Toronto’s beautiful Distillery District. Showtimes are at 8:00 pm Tuesday to Saturday with some 2:00 pm matinees. The show is approximately 1 hour, with no intermission. More details are available at www.soulpepper.ca.